OPINION: Has Nonu stepped into World Cup contention? Ruud Kleinpaste with a Kauri snail at Owairoa Primary School. Times photo Wayne Martin. He didn’t just open a can of worms, but a bag full of insect specimens, invertebrates and menacing traps. Bug man Ruud Kleinpaste recently opened up a big bag of creepy crawlies at a teacher’s-only day at Owairoa Primary School. 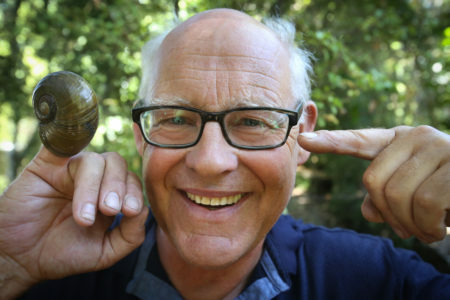 The former host of TV series <ITALICS> Buggin’ with Ruud on Animal Planet had flown in from Christchurch to orient the teachers on being ecological detectives. Learning from nature is what we need to do if we want to rediscover the peace manual for planet earth said the self-confessed nature nerd. He encouraged teachers to work with children to build a database of bugs, plants, skulls, poos and insects saying there is a big disconnect. He stressed the importance of connecting kids with nature in the age of texting. “We are losing 150 species on the planet every day,” he said of the silence of the bugs. Ruud shared some interesting fun facts as he spoke of robots on Mars being modelled on cockroaches. “It’s all about bio-mimicry. While the human species has been on this earth only for 150,000 years, the evolution of the earth has been for millions of years. Organisms are spectacular. The leggy pests are being used as models for futuristic explorers on Mars,” said the passionate entomologist. Talking of restoration and conservation projects that schools should work on, he encouraged teachers to talk to children about farming and its history. “Maori trained seagulls to get the caterpillars off their crops. There was so much wisdom in that. “Also, do you know that it is really tough to cut open a silkworm’s cocoon but in ancient China, an emperor’s wife was having tea in the garden and had a silk cocoon accidently drop in her tea cup. She discovered that due to the heat of the drink it started to unfold yard by yard. That’s how they started dropping cocoons in hot water to open up,” he said. Ruud who has been talking to a group of schools in east Auckland suggested that teachers and students outline a patch in the school and try and identify different organisms and pollinators that visit the school grounds—thus creating strong connections between nature and children. The Easter long weekend is upon us. What does it mean to you? Join the Times Online Newsletter for the latest news, developments and more! Our awards winning publications continue to grow from strength to strength both in print and online. If you have not made use of our success yet, make contact with us today to get your product or service in our publications.